This is a review of two rods that are quite different from the rods I normally use. Different as I normally prefer faster action rods. As the rods are quite similar I’ve chosen to review them in the same article. In general, I’m more concerned with the way a rod performs than the way it looks, but I have to say, the Orvis Zero Gravity-series are beautiful rods. From the bottom and up, the reelseat sports a beautiful, light hue Tiger Maple insert. The end cap doubles as an uplocking nickel silver reelseat, which is a nice detail, albeit a little heavy. The blank is a nice deep red, the stripping guide is silicone carbide and the snakes hard chrome. The guides are wrapped with a thread matching the blank colour, and varnished to perfection. Each part is fitted with small, discrete alignment-dots - some hate them - I happen to love them! Both rods come in a red, powder coated aluminium rod tube and a rod bag. When push comes to shove, it’s the performance that counts. I have fished both rods in lakes and streams. I have used floating lines (S.A. GPX and ED and an old Rio Accelerator), intermediates (S.A. Mastery Uniform Sink), Sink Tips (Teeny MiniTip) sinkers (S.A. Uniform Sinkrate II and IV) and shootingheads in several densities from floaters to sinkers, all with standard tapered monofilament leaders. 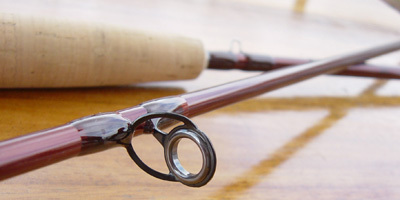 If you’re not familiar with Orvis’ Flex Index, the higher the number the stiffer the rod, so at first glance it is given that these are not stiff rods. When cast both rods load fairly easy with a short line, which was very pleasant on the small rivers I fish here in Denmark. The easy load makes casting heavy flies short and medium distances easy, and almost pleasant. The deep flex is a real pleasure when fighting fish. When lengthening the line, the flex becomes even deeper, though without ever feeling that the rod gives in under load. Both rods are extremely easily cast up to around 70 feet. I cast several 85-90 foot casts with the 9-footer (w. the ED-line), but they are infinitely more pleasant in the 20-70ft range offering good linecontrol and good presentations. The deep flex makes both rods, but in particular the 9’, a pleasure to rollcast. You won’t get super high linespeed and electric loopshapes, but easy casting with good presentations. The tip on both rods are fairly stiff, which I really like. I took the 8’6” in the floattube on a small private lake fishing for rainbow trout. The day was hot and sunny and called for sinking lines, and I was a bit concerned when I rigged the rod with a 30’ sinkrate III shootinghead, but the rod handled a sinkingline well. The deep flex made it a pleasure fishing the high-density head. Lars Chr. Bentsen (Viking Lars) (lars@sexyloops.com) is a medieval archeologist flyfisherman - possibly the first. When not plundering, he either flyfishes the salt "concentrating at all times" or else investigates ruined castles, abbeys and burial mounds (this is true-life stuff). He is an FFF Certified (or at least certifiable) Master Flycasting Instructor and has a bag fetish. Lars lives with Pauline and their daughters, Anna and Elvira, and they try to live with him.